Posted August 17, 2014. Those of you who know me well know that I am surrounded by football players. 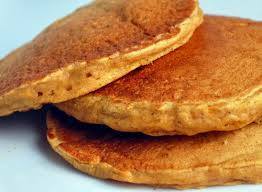 These pumpkin pancakes are a favorite! This is also a great recovery food for people with Lyme disease as there are no grains, so low in carbs/sugars and high in protein and all the immune boosters from the pumpkin. A great fall breakfast! Blend all together. I put everything in my blender, then cook in coconut oil. You can eat them with pure maple syrup (make sure it’s grade B, higher in vitamins), but I just eat them plain. Pumpkin is a great source of iron (immune boosting) potassium (so important for the serious athlete) and of course vitamin A. Enjoy! This entry was posted in Lyme Symptoms and tagged Diet. Bookmark the permalink.